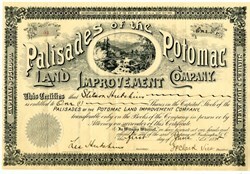 Beautifully engraved RARE certificate from the Palisades of the Potomac Land Improvement Company issued in 1893. This historic document has an ornate border around it with a vignette of a waterfall and was printed by Gedney and Roberts of Washington DC. This item is hand signed by the Company’s V. President, J. P. Clark and Secretary, Lee Hutchins and is over 123 years old. The certificate was issued to Stilson Hutchins. The Company was headed by Stilson Hutchins, the founder of the Washington Post in 1877, Jacob P. Clark, Vice President, and John C. Hurst, real estate broker, among others. Clark and Hurst came to Washington, D.C. from Canada. Hutchins had retired from the Washington Post in 1889, and likely became involved with the real estate venture because his summer house was located within the Palisades area. The company was involved with large home subdivisions. They planned it as an expensive suburb with homes of the type then being build on the Hudson above New York and built several large Victorian houses. Stilson Hutchins' home was at the present site of the Army Map Service. Glen Echo Park was also located in the Palisades of the Potomac area. The Palisades, or simply Palisades, is a neighborhood in Washington, D.C., along the Potomac River, running roughly from the edge of the Georgetown University campus (at Foxhall Road) to the D.C.-Maryland boundary (near Dalecarlia Treatment Plant). MacArthur Boulevard (once called Conduit Road) is the main thoroughfare that passes through the Palisades. In 1893, this subdivision was laid out by the Palisades Improvement Company. The Palisades had the Great Falls Electric Railway that ran from 36th and Prospect streets out to Glen Echo. The International Athletic Park and Amusement Company secured a large block of the Palisades and constructed a Bicycle Track and General Amusement Park, which opened on Decoration Day in 1896. Also encompassed within the Palisades is the neighborhood of Potomac Heights, which is bounded by Loughboro Road at the north end, Arizona Avenue at the south end and MacArthur Boulevard and the Potomac River. 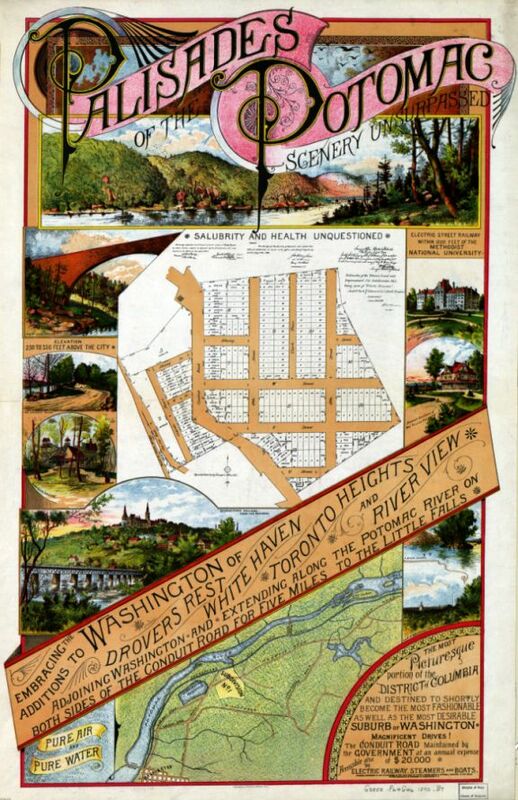 In June 1909, the Potomac Heights Land Co. (based in North Carolina) acquired 75 acres (300,000 m2) previously known as the Athletic Park tract at the reported cost of $1000 an acre. The tract extends parallel with and between Conduit Road and the Potomac. It is divided by the Washington Railway and Electric Company, which ran from Georgetown to Glen Echo for a 5 cent fare. There were 800 lots at $450–$500 per lot and no home was to be erected at less than $2500. The Palisades is one of the lesser-known neighborhoods in Washington, with a mixture of detached houses, townhouses and apartments. The homes along the bluff on Potomac Avenue offer a broad view of the Potomac River and the Virginia riverfront, with often impressive sunset views. The current Palisades Library was dedicated in November 1969 replacing the former library in the Conduit Road Schoolhouse. Battery Kemble was at an elevation on Ridge Road (now Nebraska Avenue). The battery held two 100-pounder Parrott rifles, placed to sweep Chain Bridge and Virginia beyond. The site is located within Battery Kemble Park, bounded by Chain Bridge Road, MacArthur Boulevard, 49th Street, and Nebraska Avenue, NW. Fletcher's Cove is on the Potomac River and the C & O Canal National Historical Park, between Chain and Key Bridges. Fletcher's has been in this location since the 1850s and is renowned as a superb fishing and recreational area. The nearby Abner Cloud House is the oldest building on the canal, dating back to 1802. After 145 years of business, the fourth generation of Fletchers retired in 2004 and Guest Services Incorporated, a National Park Service concessionaire, assumed responsibility for the operation of the concessions. The area surrounding the boat house was then officially named Fletcher's Cove, though most people still call it Fletcher's Boat House. Other notable landmarks making the Palisades unique are the old Conduit Road Schoolhouse on MacArthur Boulevard, Palisades Community Church (1923), The Lab School of Washington (1967) (formerly the Florence Crittenton Home for Unwed Mothers), the German Embassy, St. David's Episcopal Church (1940), Sibley Hospital (1961) and Gen. Montgomery C. Meig's Washington Aqueduct/ Delcarlia Filtration/ Water Treatment Plant (1853). Remnants are everywhere of the old Capitol Transit #20 trolley (Union Station to Cabin John) that was a very popular ride though the Palisades out to the Glen Echo Amusement Park (1898–1968). Designed by John J. Zink, the MacArthur Theater, originally a single 1,000 seater that was tri-plexed in 1982, was in use from December 1946 through March 1997. On September 11, 1936, at a cost of $40,000, the Palisades Playground and field house was dedicated at its current Sherier and Edmunds Place location. The Palisades neighborhood is the home for a variety of popular restaurants such as Figs, Makoto, Bambu, Bistroquet, BlackSalt, Chen's Gourmet, Seventh Hill Pizza, Kotobuki, DC Boathouse, Et Voila' and the new Salt and Pepper Restaurant, and its very own pet supply store, Profeed of DC. A high point of the year for many in the neighborhood is the annual July 4 parade, featuring local bands, fire engines and children on highly decorated tricycles and bicycles. Twelve years later Hutchins sold his healthy journalistic offspring in order to pursue his interest in the development of the Mergenthaler "linotype" machine which was revolutionizing the printing industry. History is from The Washington Post.